I’ve been making sure I have flowers on my desk. Just a few tulips, usually. I buy them with the groceries, and pretend they are food, which I guess they are — food for my eyes and spirit. I smile whenever I look at them. 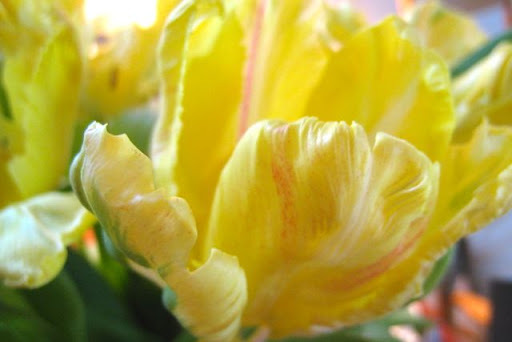 Tulips don’t have much of a scent, but there’s a cool freshness that surrounds them like an aura. Flowers on my desk are such a small way to lift my spirits. Are there little things you do for your Self, too? I buy tulips too..or daffodils if no tulips are to be found! I would love – love! – to have fresh flowers in the house at all times but my cats are serial plant eaters and there is no place to put a bloom or two where I can see it but they can't get to it. Annabelle ate tulips, so I couldn't have them in the house. Rosemary pays no attention. I get such a lift from flowers on my desk! Anytime, really. . . but especially in the early spring. I think I'm going to adopt your philosophy . . . that flowers are food . . . are start popping them in my grocery cart a little more often!